Members of the Alliance for I-69 Texas board of directors, representing communities from Texarkana to the Rio Grande, are urging voters to support additional reliable funding for Texas highways by approving Proposition 7 on the November 3rd constitutional amendment ballot. They join community leaders across Texas, state officials,member of the Legislature, more than 100 chamber of commerce and local economic development organizations and scores of state associations that have endorsed the amendment. If approved it will dedicate $2.5 billion a year in existing general sales tax revenues to non-toll highway construction. Additional funding will also come in the future from growth in sales taxes collected on the sale of motor vehicles. These funds will help replace one-time funding and bond debt financing that have helped keep the pace of construction going in recent years. This consistent and growing stream of revenue is vital to systematically improving highway mobility and safety through new lane capacity, upgrades, new lane miles and bridge. Interstate 69 in Texas is being built as a series of many incremental projects upgrading existing highways to interstate standard. That work requires planning, environmental clearance, design, right of way adjustments and finally construction -- a process that can stretch out over many years. Having a more reliable stream of revenue will make it possible to get funding for identified priority projects that help move growing traffic loads, provide safer conditions and help sustain business and jobs. Governor Greg Abbott, Lt. Governor Dan Patrick, House Speaker Joe Straus, Senate Transportation Committee Chairman Robert Nichols and House Transportation Committee Chairman Joe Pickett have been joined by many other members of the Legislature in letting Texans know they support Prop 7 passage. They are talking to voters and making their case in newspaper endorsements. Abbott told a Waco audience that passage of Proposition 7 "is so incredibly important." Senator Nichols, chief author of Prop 7, has been speaking to groups around the state. He told a Midland-Odessa gathering that that transportation funding has been a growing issue in the Legislature for years as existing funding sources fail to keep up with population growth and the need for highway maintenance and improvements. He pointed out that Prop 7, like Prop 1 that was passed overwhelmingly by voters in 2014, is a step forward in returning Texas to a "pay as you go" system rather than bond debt financing. He again pointed out that fuel taxes are a dying revenue source as vehicles use less fuel per mile traveled, more vehicles pay no fuel tax and some people are driving less. He stressed that using the sales tax to help pay for highways is significant because sale tax tends to grow steadily and is predictable. State officials are joined in their support for Prop 7 by many Texans that have been advocating increased and sustained transportation funding for many years including the Alliance for I-69 Texas, the Transportation Advocates of Texas an the Greater Houston Partnership. 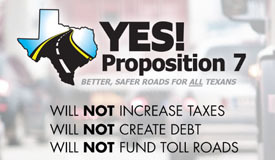 Organizations associated with the Transportation Advocates of Texas are working to inform Texas voters about the growing need to fund highways and Proposition 7. They are working with local community leaders and elected officials to explain the growing urgency of additional funding for transportation. Speakers are appearing at community meetings and transportation advocates are meeting with newspaper reporters and editors. This is a portion of the Texans for Prop 7 informational website. Texas Infrastructure Now has produced an entertaining musical message featuring Ray Benson that asks Texans to "finish the job" by voting Yes for Prop 7. You can see it HERE.